After spending the last few months searching for a literature curriculum for the younger boys, I've come to prefer using Lexile Measures to find books, rather than searching by grade level. 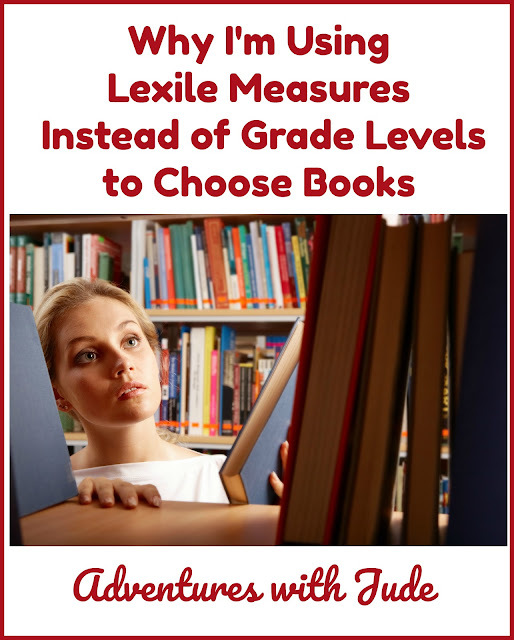 Why?Lexile is a standardized measurement, while what "grade level" a book is slotted at seems much more variable. For example, Memoria Press puts Little House in the Big Woods as part of their 3rd-grade literature program. Veritas Press says it's for 2nd graders, and Moving Beyond the Page puts it in their 4th-grade equivalent (ages 8-10) program. That's three high-quality curriculum programs, but they all suggest it for different ages. And it's not just this book in particular - I've noticed literature curricula all seem to have their own ideas of what book is right for what age. Even Lexile alone is slightly confusing. 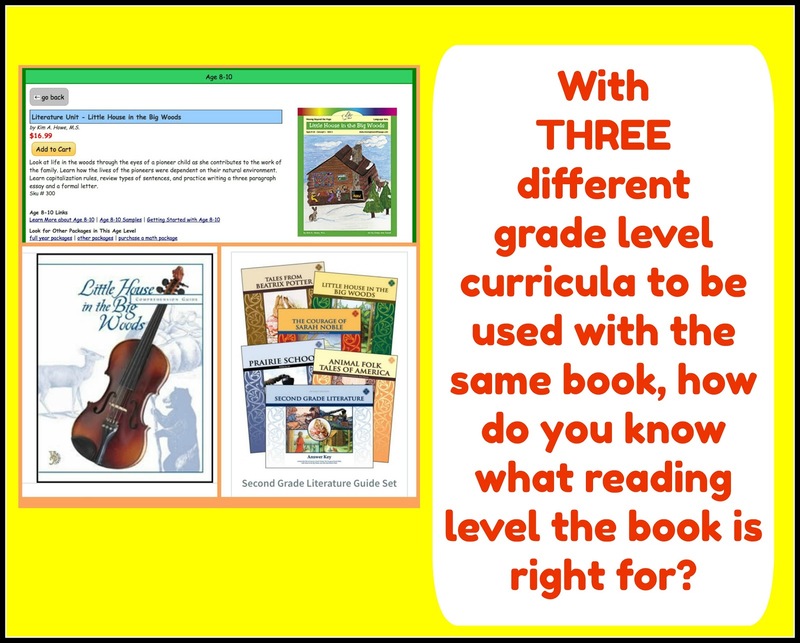 The book scores at 930L, which by "grade level" would be readable by a high-average 5th grader. So just what reading or grade level IS this book for? Now, I'm not saying it's this or other hard-to-discern-who-should-study-them books aren't good literature for younger (or older) children to hear! The stories of the Ingalls family, or of a spider named Charlotte and a refrigerator full of Poppers Performing Penguins, are perfect for nearly every age! My concern is trying to determine how to decide what age/grade level is a book going to be most appropriate for use as a lit study, or even as a "here, turn the TV off and read this instead" book, especially when your child isn't average-for-his-chronological-grade. 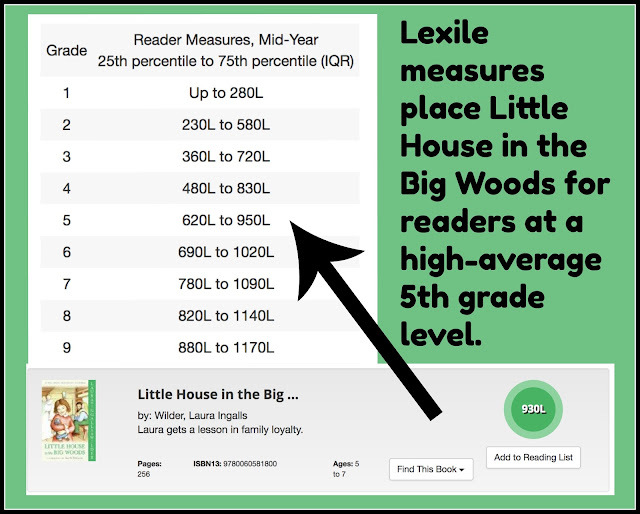 Now, of course, Lexile has its limits, and the company even stresses that just because one book is at a certain level doesn't mean a child can (or should) read every book in that range. 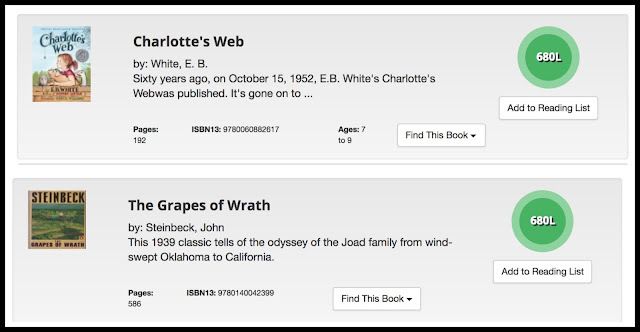 After all, Charlotte's Web and The Grapes of Wrath are both classic books and at the same Lexile level, but they're definitely not written for the same audience! 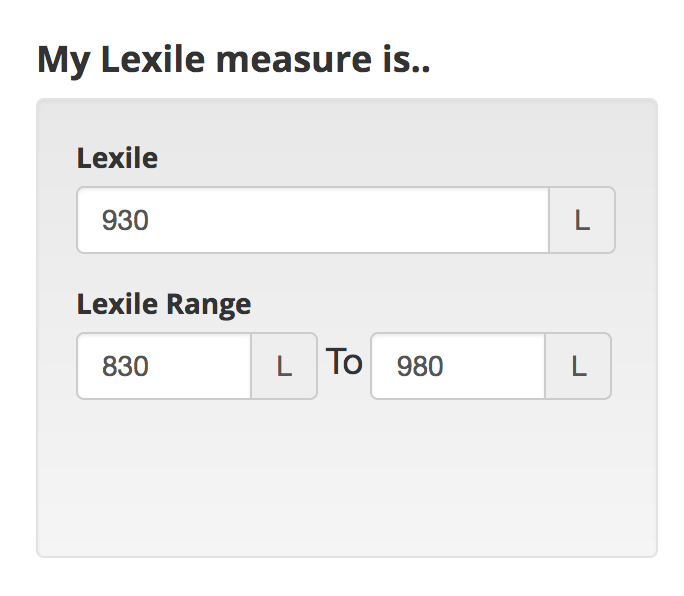 So...where do Lexile Measures come in? If they don't tell you how appropriate a book may be, what's the point? 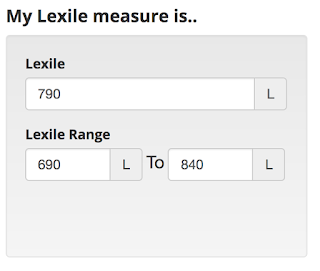 The answer to that is this: a Lexile measurement can be used to identify the appropriate difficulty level of a book. Using Lexile means I can look at any book the boys or Celia are interested in *individually* and say "This should be easy," "It's a good stretch," or "Um...let's hold off on this for a bit." Jude's personal comfort zone is the Magic Tree House series, which measures generally in the low 300s. He has also been reading Damien's Geronimo Stilton series books, which are a lofty 600ish. Jude's always been a "Why crawl six feet when I can move four and then stretch my fingertips to reel it in?" kind of kid, so "comfy with 300-level books when definitely capable of 900s" seems about right for his personality. If I use Lexile's Book Finder feature as my calculator, I can find out what Jude's "ability comfort zone" is. To encourage him to move all six feet, I've been trying to find high-interest, age-appropriate books for Jude in the low 800 range. Some of our recent home library additions are books by Roald Dahl (high 700s/low 800s), and Beverly Cleary's Ralph S. Mouse series (860L). These are quality stories that are great for a 10-year-old boy and are purposely at the low end of the range. I want him to find books in a "stretch your comfort zone but not be overwhelmed" place, so he discovers the beauty of recreational reading. I'll reserve books that are at the higher end for "school" books. This way, I can help him work through the stories if he runs into problems. If I look at those for grade level, they're generally labeled for grades 3 to 7. That's a pretty wide range of age. However, knowing the content is appropriate for middle-to-late elementary kids, I can be comfortable using Lexile for the ability level and know he's not going to be overwhelmed and give up on reading. 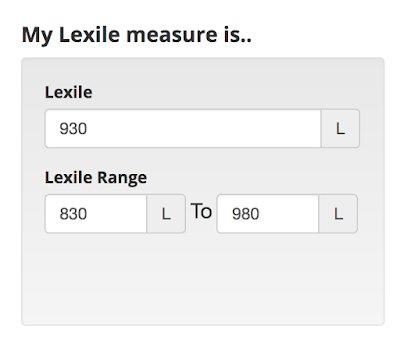 I'm also using Lexile Measures to help Damien find new books. Like most little brothers, he is perpetually trying to keep up with the bigs. While Jude did really well studying Little House in the Big Woods, Damien struggled a little. He enjoyed the story, but when it came time to work on the study that went with it, he had a difficult time recalling some of the finer details of the story. This says to me that 930L is a good zone for a read-aloud that will expose to excellent storytelling, but it's probably too high a mark for him to work with on his own. This past spring, we read A Bear Called Paddington (750L) and Winnie the Pooh (790L) and he did well with comprehending those. Plugging those into the calculator, that puts his suggested range between 690 and 840. We'll do the same thing, sticking to books at the lower end for independent reading, and higher for literature studies. I have a feeling he'll be stealing his brother's Ralph books soon enough! I can also use Lexile measuring to put some books in the "not right now" pile. One of the stories Jude would like to read is The Call of the Wild. It's a high-interest book for him (he's obsessed with sled dogs and Alaska), but at 1120L, the writing would probably overwhelm him. Knowing that, it's a book that either will become a "later on" book; we'll probably save it for a read-aloud for when after he's comfortable in the high 1000s. It definitely helps him understand and not feel like it's Mom saying know if I can show him, "This is your range, but this book is much higher, let's save it for later." I love that homeschooling allows us to tailor the boys' studies to what they are capable of, rather than just picking something and hoping they do well. Using Lexile measures really helps me find books that both instill confidence and push them to grow without overwhelming them.